Note: I've been MIA because of CNY (figure the acronyms out yourself--am too tired to type!). We have relatives from Shanghai, my bro and family from Singapore stayed with us about 4 days, ate endless CNY dinners and had lots of visitors/visited friends, my kids each had turns hosting parties in the house (kids do learn from their parents don't they) and I am so tired that I wish I'm alone in some remote mountain. I left my camera in a friend's house and when I get it back, I will upload some CNY photos. I hope you had a great CNY too. 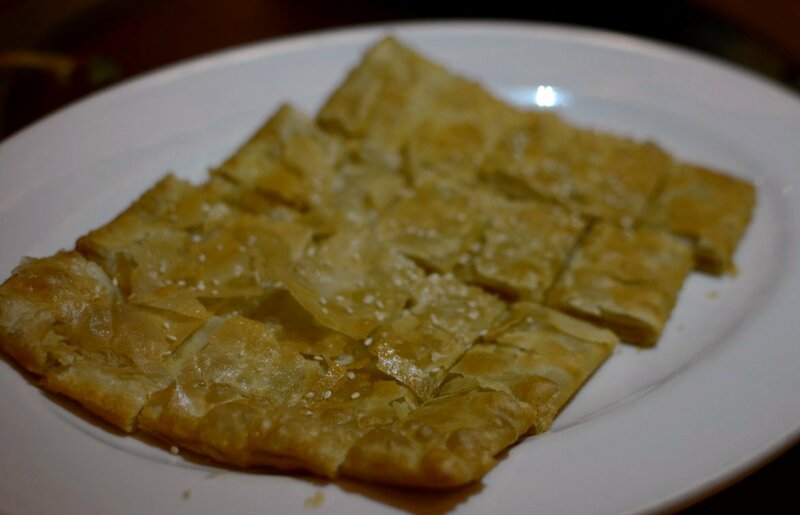 A week before CNY, Julia, the Communications Manager at Hyatt Regency Kinabalu invited me and a handful of other bloggers and media people to dinner at The Chinese Restaurant in the hotel. Chef Tay of the restaurant had created a special menu of 12 auspicious dishes to celebrate the start of the Year of the Dragon. The promotion started on 16th January and will run for the duration of the CNY celebrations. 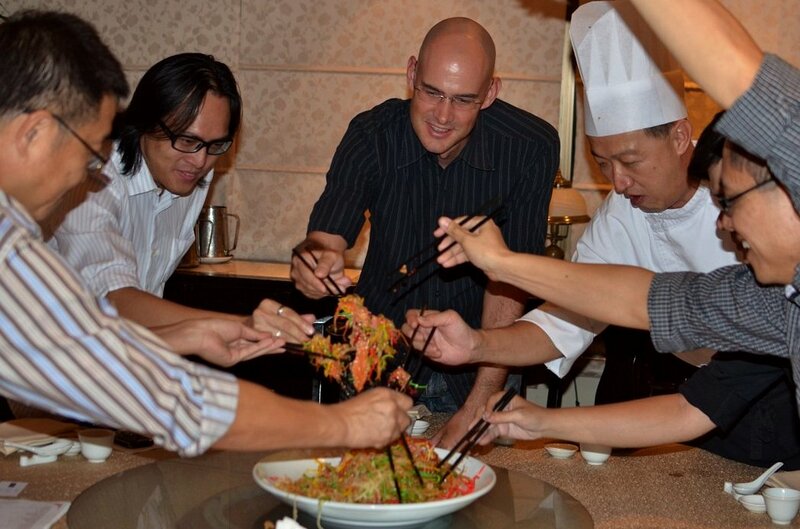 We started with lou sang/yee sang, a salad of veggies, fruits, flour crisps and raw fish. The dish is Malaysian-Singaporean and is eaten on the first day of CNY for an auspicious start (you can't write a CNY post without that word). 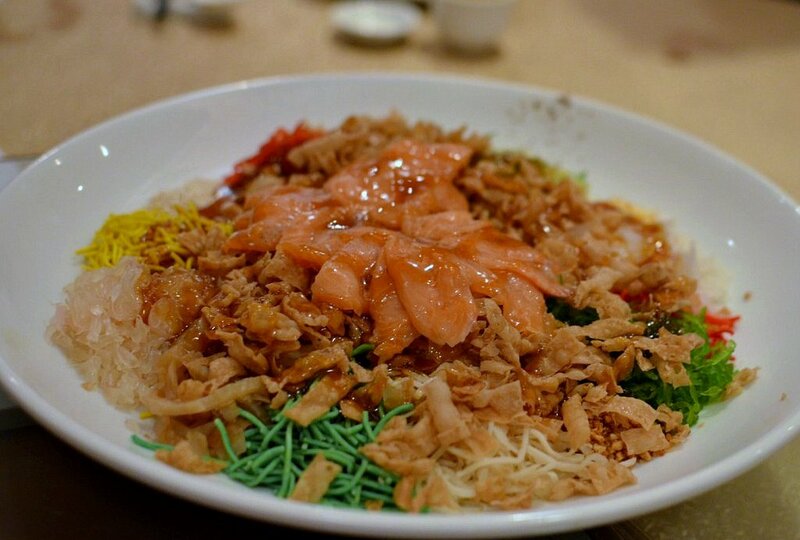 Salmon yee sang, RM88/USD29 (medium). 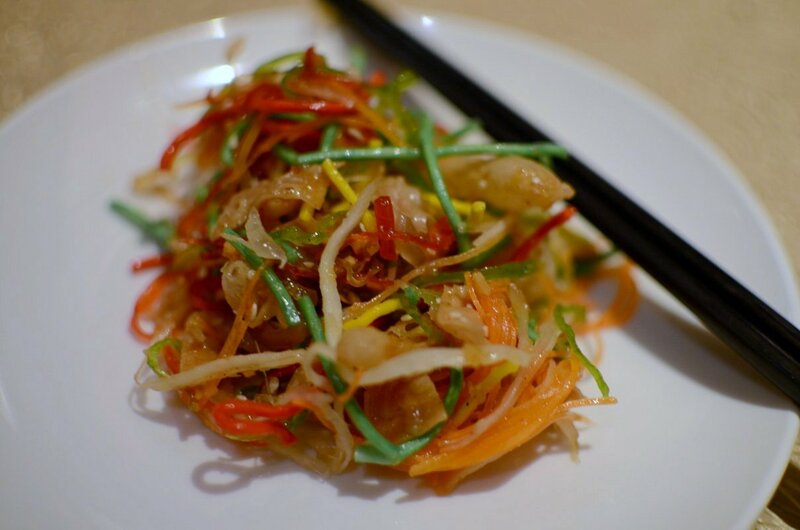 The restaurant also has a choice of abalone yee sang (RM188/UDS62) and tuna yee sang (RM68/USD22). The number 8 in Cantonese sounds like 'prosper' and prices of the CNY menu are priced around that lucky number. Diners toss the yee sang while shouting auspicious phrases, usually calling for prosperity and a healthy long life. I've found yee sang in hotels and restaurants overly sweet. The artificially-colored flour strips give crunch and color but I much prefer home made yee sang using veggies and fruits which may not look as fine but is far more tastier. 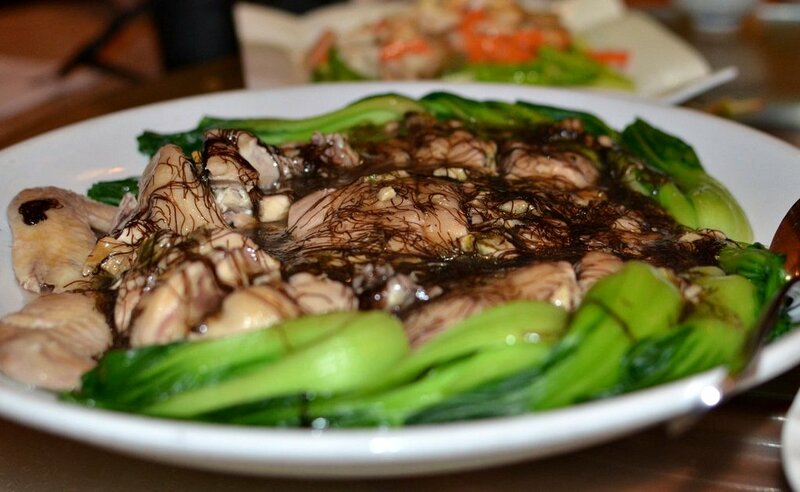 Steamed chicken with dried oysters, RM58/USD19 (large). This looked really good doesn't it. I didn't taste any dried oyster but I though it was a good way to feature fatt choy (a rare black algae, eaten during CNY because its name sounds like "to grow rich/prosper"). Unfortunately, the chicken was rather bland. I think that this is would be a great dish for CNY reunion dinners but the chicken has to be home-reared or at last free-range. My hub and I both enjoyed this light and tasty dish of sea asparagus and pacific clams with Thai asparagus, RM88/USD29 (medium). 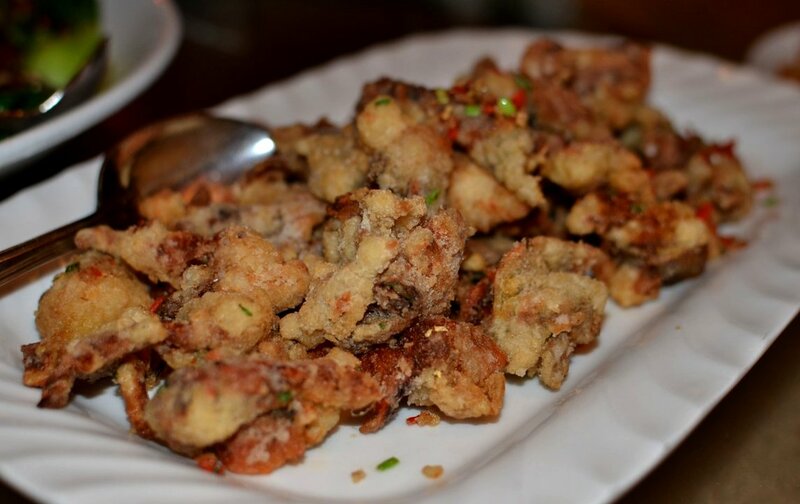 I'm not particularly fond of soft-shelled crabs because they are usually nothing but deep-fried crab shell membrane, which is just deep-fried greasy batter. This plate of soft shelled crabs however was the best I've eaten--and I had just had deep-fried soft shelled crabs two weeks before at Gaya Sports--because the batter was super light and crispy while the crabs were very meaty, tasty (I think it was chicken stock powder) and all the pieces I ate had roe in them. 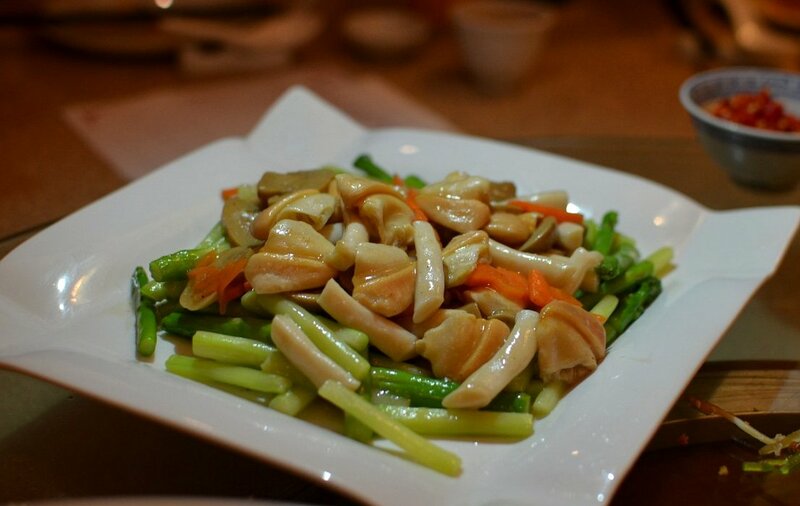 Superb, the best dish of the dinner. I would go back just for this but Chef Tay said that not every batch of crabs come this good. This is not on the special CNY menu and availability is dependent on the supply of crabs. 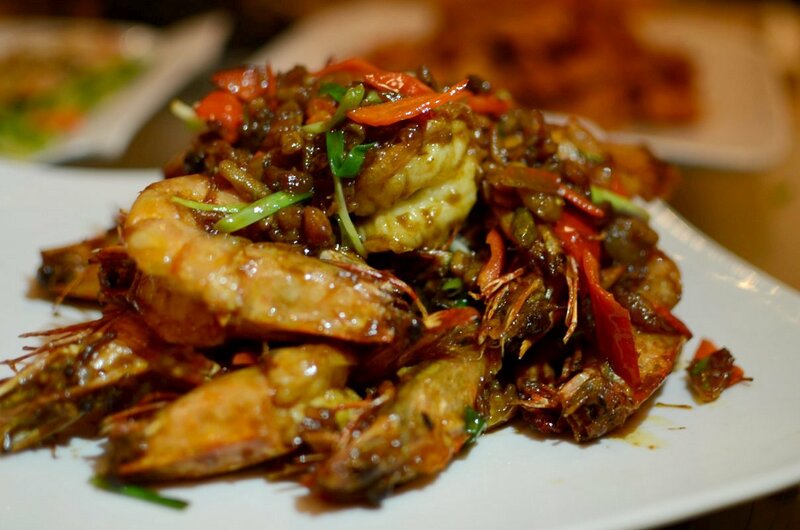 King Prawns XO Fortune sauce, RM88/USD29 (medium). The prawns were fresh and meaty, and the sauce was good if only it wasn't so salty. 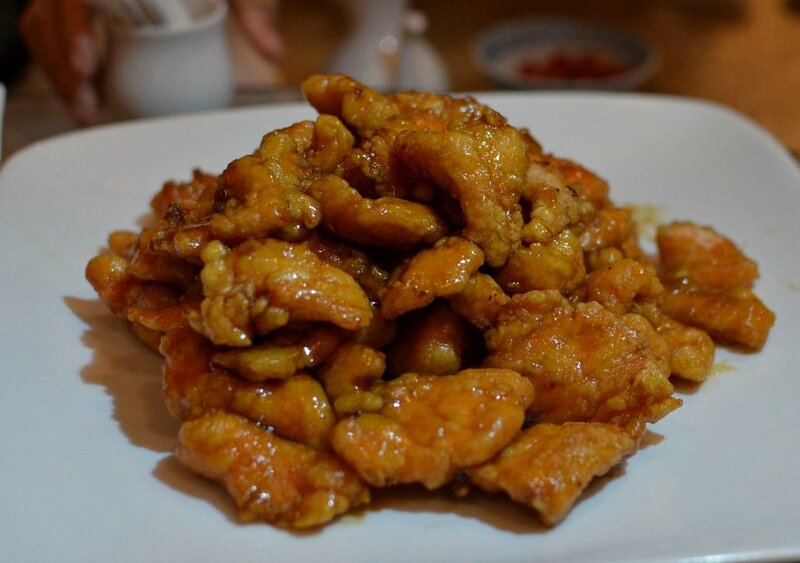 Crispy fried salmon with honey sauce, RM20/USD6.60 per 100 gm. This was quite good but the sauce and deep frying overpowered the flavor of the salmon so I think it's a waste of a flavorful and expensive (at RM200/kg, 8 times higher than choice local fish) fish. I'd cook this dish with any white fish. 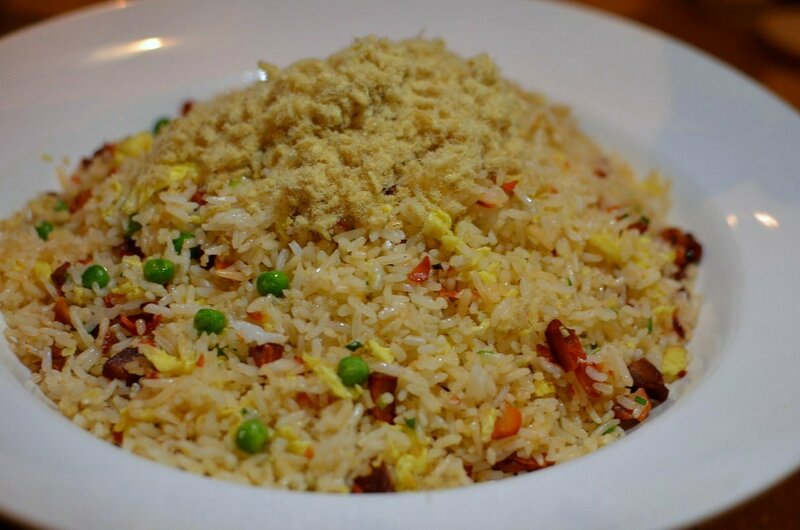 Fried rice with bbq chicken and chicken floss, RM48/USD16 (large). I didn't like the bbq chicken. 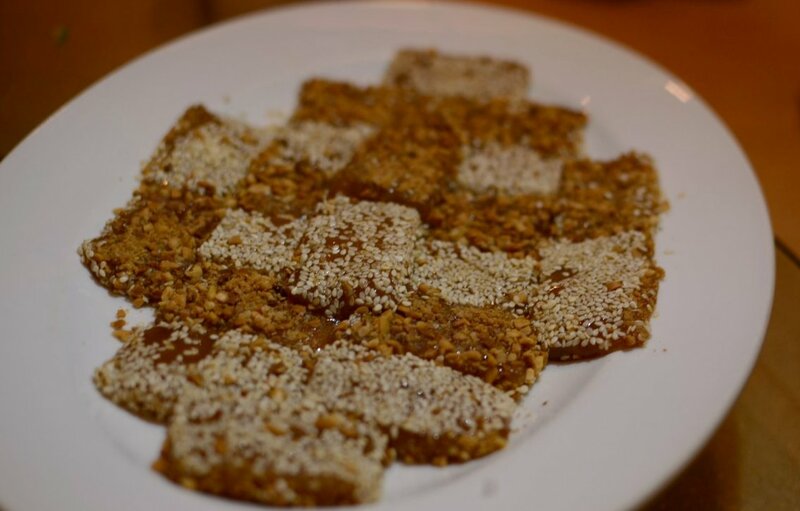 I liked this, steamed slices of sticky glutinous 'cake' coated with peanuts and sesame seeds, RM18/USD5.90. Hub found it too sticky but hey it is sticky cake. Lotus paste pancake done very well, not too oily and not too sweet. There were some hits and some misses but considering the attention to each dish compared to the mass-produced dishes at the bigger restaurants, especially the seafood restaurants, I'd say The Chinese Restaurant has some great dishes --provided you don't mind paying the higher prices and the standard hotel ++ charges. Besides the CNY a la carte menu, there are two set dinner menus priced at RM88.88 per person and RM118.88 per person (minimum 5 persons). Hey Terri, Gong Xi Fa Cai to you and your family! Hugs! Deep fried salmon is indeed wasteful. I think with that sort of price and taste, best if one poach or gently steam it? I love the variety and colours you find in a Chinese feast. I didn't realize there was a Hyatt in Kinabalu. My fav spot there is the Shangri La - the one that's about 40 min out of town. Wow!! I find these dishes really curious! It's everything so different from here...and I'd like to taste everything!! tina: you too, hugs and a happy healthy, prosperous year to you and all! malaymui: yes i did and we ate the stroopwafels n almond cookies that you brought...she loves the stroopwafels:)..said you are SO nice to bring them. gong xi fa cai to you n j and write me! yumlist: oh i love shangri la both at t. aru and tuaran.i haven't been there in years n i must check them out bc i heard they have a new jap restaurant. btw, michelle, have you seen Buf Puf in KL? those sponge scrubs saved my skin when i was a teenager n recently i suddenly rmbered them n want to get them for my kids. Hi Terri. These dishes look really good. Thanks for sharing because I couldn't think of a good restaurant for Chap Goh Mei this Monday. Love reading your reviews, so honest and trustworthy!